Many commentators have said how unfortunate it was that Honey Lee’s question AND answer were both so poorly translated by her Korean interpreter. This is a very common problem at Miss Universe pageants. Many of their interpreters do a pretty sorry job, mostly because they are even more nervous than the competitors! Poor them – can you imagine standing next to some of the most beautiful women in the world when you look perfectly ordinary? In any case, that should not be the excuse. Pageants have been won and lost on the basis of interviews, and some people believe this to be the case this year. Honey Lee’s interview on the Miss Universe website was absolutely charming, and she did manage to project that same charm on screen. Well done, Honey! Here’s what Pop Seoul had to say about Honey Lee’s translation woes. Riyo Mori and Oprah Winfrey wearing the same dress? People.com ran an interesting article. Apparently, back in Feb Oprah wore the same Gucci dress that Riyo Mori wore when she was crowned last week. People has pictures, and there are a tonne of comments about which one wears the dress better. Seventy-seven of the most beautiful women in the world begin leaving Mexico City after a month of intense competition filled with laughter, tears, camaraderie, quesadillas, and margaritas! But for one them, Miss Japan Riyo Mori, who was crowned in front of a televised audience of over one billion people, her journey will be to New York City, where she will reign in a penthouse overlooking the Upper West Side. Riyo Mori will begin her reign as Miss Universe 2007 serving a slew of charitable causes, walking down miles of red carpets, and being photographed a Brazilian times! What a life, I say! What a life! Not bad for a 20-year old dancer from Japan. Here she is in her final hours in Mexico City before she heads off to the bright lights of New York City! And so we have our second winner from Japan! Riyo Mori is the second Japanese woman to win the pageant. The first Japanese, and indeed the first Asian, to win the Miss Universe pageant was Akiko Kojima in 1959. It took almost 50 years for another Japanese woman to be crowned Miss Universe. It was about time! Thank you to all who have kept me company these last 2 hours! It was a wonderful 2 hours. I love it that Japan has won. Please email me at paul.rozario@gmail.com if you have any questions at all about everything! The New Miss Universe is Miss Japan Riyo Mori! I love it! 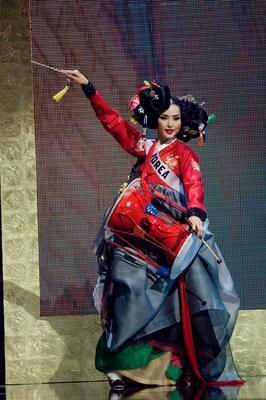 The first Miss Universe from the Far East since Miss Thailand in 1988! RIYO MORI IS THE NEW MISS UNIVERSE 2007! In fifteen minutes, we will begin.